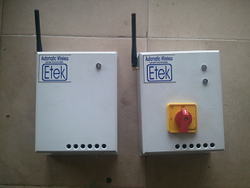 The fully automatic water level monitoring and controlling system shall be work on base of GSM network. The Remote end water tank level shall be measure by the level electrode sensor and as per level pump will be on and off at receiver end GSM modem system. Intelligent car/vehicle ant-theft device is work base on GSM when stolen your vehicle immediately inform to you by SMS and ring. after you just miss call on mobile number. the vehicle stop if it was run on the road. You get the location without GPRS. Looking for GSM GPRS base product ?